Super Soft, Super Extra Wide Fit Bootie Slipper for swollen feet and swollen ankles. A perfect choice for those who are diabetic and or have feet with edema. Adjustable closing strap that adjusts for swollen feet. Slip-resistant soles. Polar fleece with warm pile lining is wonderful for fragile skin and delicate skin. Washable. This boot slipper by Silvert is a great choice for elderly seniors with bunions, corns, hammer toes, foot edema, diabetes and podiatry foot problems. These make great slippers for nursing home patients. 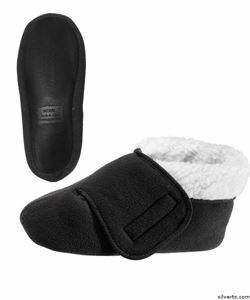 This loose boot style slipper by Silvert makes a terrific post-op post surgery slipper.